An inevitable part of our experience-based holidays is experiencing a long-haul flight to Asia. Whether you love or hate flying, it’s always handy to know cheap and effective ways to make your journey as enjoyable as possible. Our specialist tailor made travel consultants had a think and have come up with their top 4 insider tips for enjoyable flying for 2015. 1. Emergency Exit Seats – Don’t Ask, Don’t Get! These days, most airlines charge extra money for pre-booking emergency exit seats or extra legroom. It’s understandable that for some people this is an absolute essential, but if it’s more of a desirable than a necessity, why not trying asking when you get to check-in? In my experience (both personal professional) so many people resent paying up-front for emergency exit seats that the airlines are often unable to “sell” them all before the flight takes off. Therefore, why not get to the airport nice and early, make sure you are one of the first ones at check-in and ask the airline personnel if there are any emergency exit seats or extra legroom seats left. It’s more than likely that you won’t have to pay extra this way, too! As they say, don’t ask don’t get…..
Airport lounges are a great way to start your journey in comfort and style. They may look like plush members-only clubs (and in truth, a few are quite exclusive), but there are actually plenty of lounges that are open to everyone. Airport lounges offer a range of great facilities you can use like comfy chairs, wash facilities, TV, WiFi, drinks, snacks, newspapers, spa facilities and more! You can get lounge passes starting from as little as £15, but obviously the more luxurious choices will set you back a fair bit more. Ask us for more details, and get your lounge booked before you travel. Aeroplane design and interiors have changed dramatically in the last few years, with more innovative and exciting ideas being put forward to reduce jetlag, increase comfort levels and generally make passenger’s flying experiences more pleasurable. Some airlines have recently updated their fleets to offer better on-board facilities such as bigger seats, better entertainment, improved lightning, air purification and environmental control, WiFi and more. All these improvements in new aeroplanes such as Boeing 787 Dreamliner and Airbus A380 are the best way to make your journey as comfortable as you can, so speak to us about which airlines have the most up-to-date fleets to up your chances of flying on a new plane with shiny new features such as in-ceiling lighting to look like the stars at night! 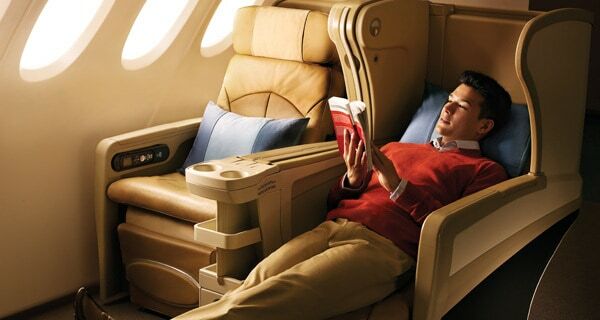 Anyone lucky enough to have flown business class before will know how much of a positive difference it can make to your journey. This can come with a pretty hefty price tag, but a great new scheme run by some airlines mean you can bid on business class seats and bag yourself an upgrade for considerably less than full price! Certain airlines now offer un-sold business class seats up for online auction a few days before the flight is due to leave, and although airlines refuse to state average winning bid prices, we had one client that managed to win an upgrade to business class from London to Colombo with Sri Lankan Airlines for £120 per person! We can’t promise this will happen to everyone but we can certainly let you know which airlines offer this opportunity. 5. Cheaper Premium Economy Flights? Try Flying Half-and-Half! Premium Economy upgrades often look more expensive than they are. This is because if you fly premium economy on any flight leaving the UK you are also subject to a tax premium (APD – air passenger duty). However, you do not pay an increased tax on flights in to the UK, so it can be surprisingly affordable to upgrade on your return leg. Gives us a call and speak to us about how to plan out your flights today on 020 7924 7133. Want more information and insider tips about flying? Or tailor made travel? We custom create bespoke holidays to Borneo, Burma, Cambodia, Indonesia, Laos, Maldives, Sri Lanka, Thailand and Vietnam. Call us on 020 7924 7133 today – we love to talk about travel.